Please refer to our stock # TCR6552 when inquiring. 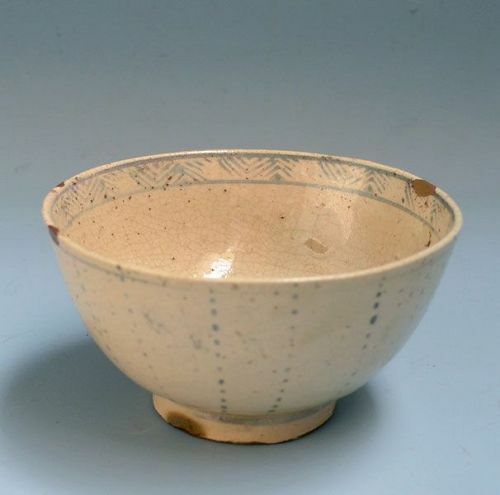 An Annan pottery tea bowl for use in the Japanese tea ceremony from the kilns of 15th-16th century Vietnam enclosed in an age-blackened kiri-wood box. The crackled pale glaze is decorated with a band of blue frets about the rim inside, a decidedly modern design of droplets descending in beads down the outside typical of early Vietnamese decoration. The remnants of a kinran gold infused cloth bag remain for wrapping the piece, the outside layer is in tatters, but the inside brocade is still supple. Named “Full Moon” (man-getsu) the inside of the box lid is endorsed by a tea master. It is 5 inches (13.5 cm) diameter. There are three kin-tsugi gold repairs about the rim. The 14th/15th century Ming ban on export of Chinese ceramics provided the opportunity for the Thai, Khmer and Vietnamese to capture a substantial portion of the Asian consumer market for pottery, and trade flourished between the Kingdoms of Vietnam and Japan. In fact according to research by Guy Faure and Laurent Schwab of the 10 officially licensed ports of trade during the time of Hideyoshi (late 1500s) seven were in present day Vietnam. This would lead to the establishment of vast trading towns and large numbers of Japanese in South East Asia until the Sakoku era when Japan closed itself to outside contact. Those Japanese still outside the country at the time were never able to return, and eventually blended with the native populations of their adopted countries. This piece has likely been preserved and prized as a Chawan, handed down from generation to generation for four centuries.